thirdly, a beautiful Ashram of Yogoda Satsang Society of India. It was founded by Paramahansa Yoganand in 1917 and it is here that he started teachings of Kriya Yoga. I went almost every evening while I was there and the meditation session was very soothing. The ashram is literally an oasis of peace and tranquility in the midst of utter chaos and pollution. Fourthly, the absence of a planned part of the capital (forget setting up new capital as has been done in Raipur and now being planned in Andhra Pradesh) and the fact that the state secretariat and state assembly is being run in the run down campus of HEC ! It’s baffling to say the least! Fifthly, new malls (Pantaloons, Reliance, Hinoo Cine-complex and crossword book-store) and authorized dealers of Audi & other such upmarket durables. Clearly, Ranchi has purchasing power in its extremities. 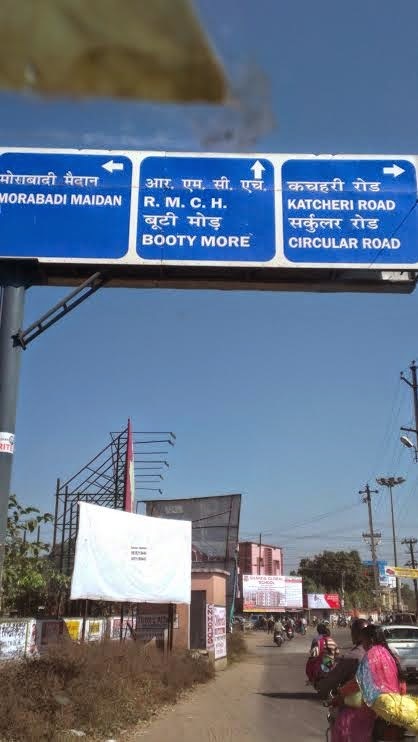 And lastly, the names of places/roads in and around Ranchi – “BOOTY MORE”, ‘HAHE”, RAHE, SILLI, GOBARDIH and so on…it used to be absolutely fascinating noticing these names while traveling. Day 1 – Visit to Yogoda Satsang Ashram (Smruti mandir) and local traffic chaos (& sightseeing including Kanke dam) in Ranchi. Day 3- Visit to “Chinnamastika devi” temple in Rajrappa (about 60 kms from Ranchi) early morning followed by visit to Hundru Falls. Now, let me describe these places one by one in the same sequence. I did cover these places and am amazed at the historical significance of some of these places. Itkhori is located about 130 kms north of Ranchi and is connected by NH 33 via Hazaribagh. The main site in Itkhori has confluence of three religion – Hinduism, Buddhism and Jainism, dating back to thousands of years ago. Located 1.5 kms away from Itkhori Block in Bhaduli Village, it is situated at Chatra Chouparan path. This place is surrounded by three sides from Buxa River which looks like U-shaped. The premise of Maa Bhadrakali Temple is surrounded with lush green forest. The statue of main deity, Maa Bhadrakali is black in colur and perhaps constructed in Shak, Gupta and Vardhan period – 1500 to 1800 years ago. 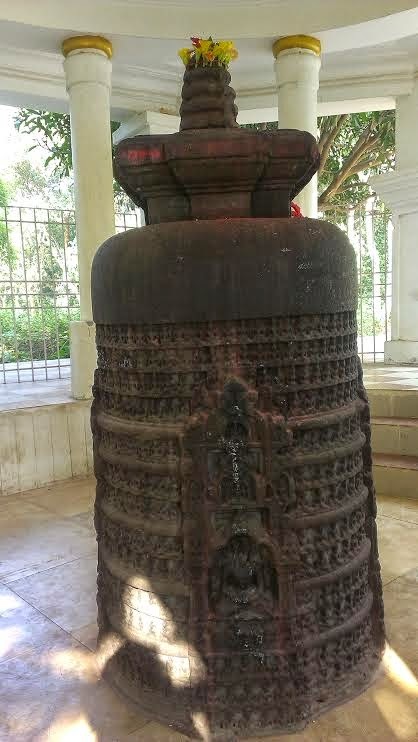 Besides Bhadrakali, seen as a propitious form of Kali, Shiva and Hanuman idols complete the Hindu influence. There is then “SahastraBuddha” - a stupa with 1,008 figurines of Buddha. The top of this stupa always has water in it. However much one dries it out, water comes in within no time. It is said that Buddha came here and was deep in meditation. In the meantime his Mausi (mom’s sister) came looking for him. She requested him to come back to the kingdom but he didn’t relent. 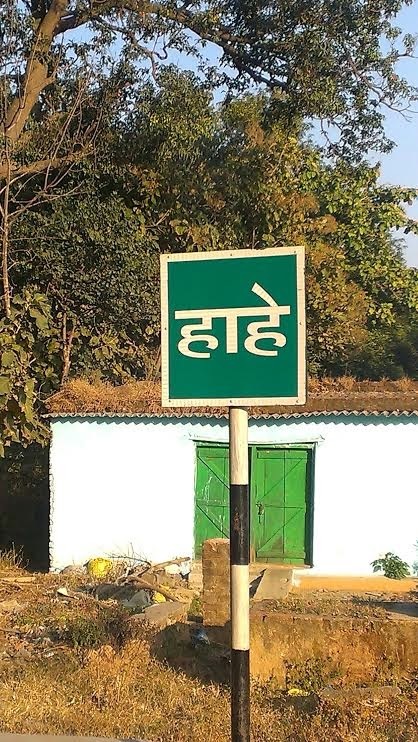 And that’s how the name “Itkhoi – Yahi kho diya” (he’s lost here) came into being ….isn’t this amazing. I was trying to read it in “Old paths, White Clouds” byThich Naht Hanh but didn’t find mention of it so far (I am yet to complete the book). 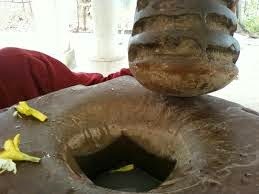 So far as Jainism is concerned, it is here that the charan paduka (slippers) of Jain Tirthankar Sheetalnath were discovered. These too are made of black stone, with similar aesthetic styles, suggesting religious co-existence in close proximity in the Middle Ages. It is said that this might have been the birth place of Jain Tirthankar Sheetalnath. I was surprised to see lot of excavated stones and statues (pertaining to middle ages) kept in a make shift museum within the temple complex. It must also be painfully true that a lot more would have been taken away by people who found them from time to time and depressing that such precious history is lost. 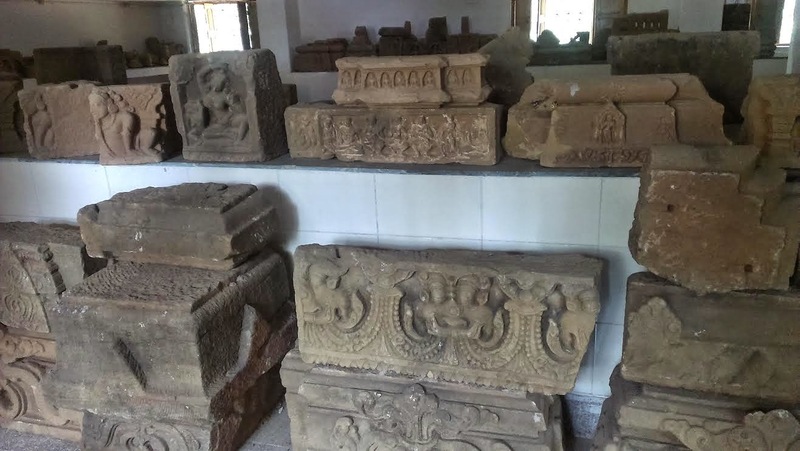 The Archeological Survey of India is yet to take up the formal excavation of the place and it is expected that with such important treasures and scriptures hidden here pertaining to Buddhism, Jainism and Hinduism, this will put Itkhori on the global tourist map. As of now, it is a sleepy village. But, looking at the potential, it is no exaggeration that “This place must have been the Patliputra of Jharkhand ” as told by Vinoba Bhave University history professor Iftikhar Alam. Rajrappa stands at the confluence of the Damodar and Bhairavi (locally called Bhera) rivers. 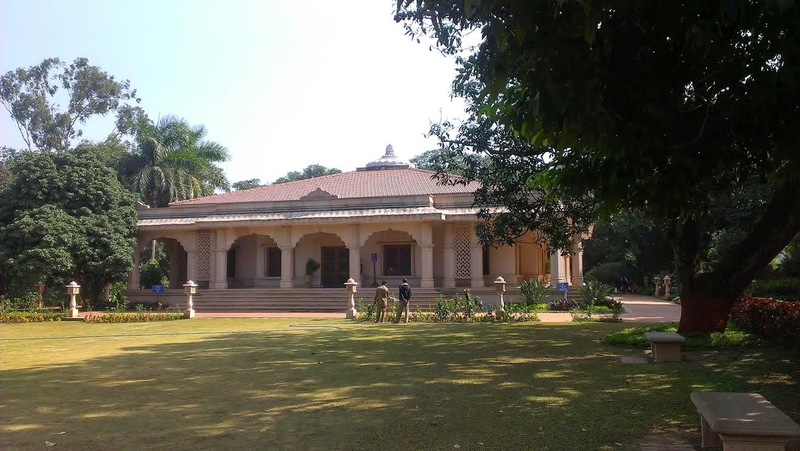 Rajrappa is located off NH 23 connecting Ramgarh and Chas. It is 28 kilometres (17 mi) from Ramgarh, 65 kilometers (40 mi) from Hazaribagh, 78 kilometers (48 mi) from Ranchi and 60 kilometers (37 mi) from Bokaro Steel City. Its best to take NH 33 from Ranchi towards Hazajibagh and take a detour from the road leading to Hundru falls. Almost everybody knows about or has been to Rajrappa in this part of the country. The main attraction is the Chhinnamasta (also known as Chinnamastika) temple. 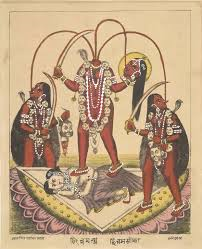 Chhinnamasta ( छिन्नमस्ता, Chinnamastā, "She whose head is severed"), often spelled Chinnamasta and more popularly called Chhinnamastika and Prachanda Chandika, is one of the Mahavidyas, ten Tantric goddesses and a ferocious aspect of Devi, the Hindu Divine Mother. Chhinnamasta can be easily identified by her fearsome iconography. The self-decapitated goddess holds her own severed head in one hand and a scimitar in another. Three jets of blood spurt out of her bleeding neck and are drunk by her severed head and two attendants. Chhinnamasta stands on the body of Kamdeo and Rati in the lotus bed. Many smaller temples have been build around the main temple such as the temples of Ashtamatrika and Dakshina Kali. 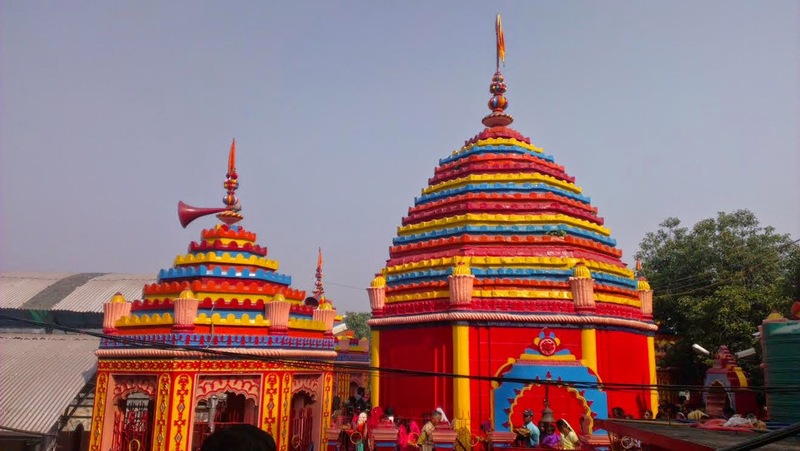 The temple is very old and the place Rajrappa finds mention in the Vedas, Puranas and Hindu scriptures as a "Shakti Peeth" which is flocked by devotees from Bihar, Jharkhand, West Bengal, Assam and Nepal. The art and architectural design resembles the design of temples of Tantrik importance. The temple is considered as notable as the tantrik site of Kamakhya Temple of Assam which has a similar architecture. The ancient temple of Goddess was destroyed and later a new temple was constructed and the original idol of Goddess was placed in it. Animal sacrifice is still practiced in the temple. The sacrificial animals are killed on Tuesdays, Saturdays and during Kali puja. A large number of pilgrims arrive here throughout the year. Large congregation of people takes place here during the full Moon and New Moon nights. Owing to the religious importance of the place, it is also popular among the disciples for marriage and ritual of Mundan or shaving the head. Vehicle owners come here to get blessings for their new vehicles as they believe that the first worship of vehicles here multiplies the life of vehicles and brings luck to the owners. Tantriks look upon this place for Tantric accomplishment. Rajrappa also is a pilgrim centre for the Santals and other tribals who come for immersion of the ashes of their loved ones in the Damodar. They come mostly during the month of December, in groups known as yatri. As per their mythology it is their final resting place. In their folk songs Rajrappa is referred to as "Thel Kopi Ghat" (Water Ghat) and they use oil after bathing. They come in significant numbers from the southern parts of Jharkhand state such as East and West Singhbhum and Saraikela districts. Maa Chinmastika devi is also known as Manokamna devi due to the belief that it fulfils the wishes of the devotees. Devotees tie a red thread around a rock in the temple for the fulfillment of their wishes. In the month of January a special fair is held here on the festival of Makar Sankranti and attended by lakhs of people. A fair is also organized during the festival of Vijaydashmi, Vijayadashami and attended by large number of people. Visitors take holy bath in the river. Geographical significance - Rajrappa Falls (more of a misnomer since the height (about 20 feet) isn’t very imposing) has tremendous geographical significance. The Damodar valley at Rajrappa is a typical example of polycyclic valley or topographic discordance which is characterized by two storey valley. The Damodar developed its broad and flat valley of senile stage before the onset of Tertiary upliftment. The river was rejuvenated due to upliftment of landmass during the Paleogene and Neogene Periods (66 million to 1.8 million years ago) by the side effects of the Himalayan orogeny and thus the Damodar excavated its new deep and narrow valley of youthful stage within its broad and flat valley of senile stage. 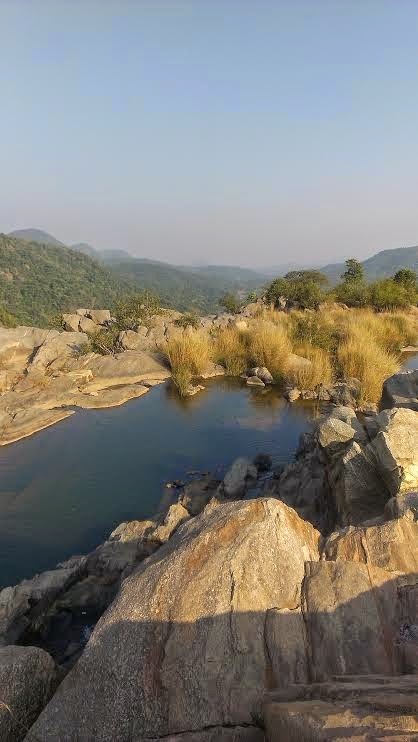 The Bhera river coming from over the Ranchi plateau makes a waterfall while joining the Damodar and thus presents an example of a hanging valley. The Damodar gorge near Rajrappa is a typical example of incised meander. The region around the temple gets very quiet and eerie after sunset. This might be the reason, Satyajit Ray chose Rajrappa as the setting for Feluda adventure Chhinnamastar Abhishap. Rajrappa is a project under Central Coalfields Limited (CCL), a subsidiary of Coal India Limited and is part of Ramgarh Coalfield. It is one of the biggest coal-fields in its region. It is widely known as the Rajrappa Project, which consist of the main quarry (a huge open cast mine), offices, colonies, recreation facilities, shopping complexes, a police out-post and public utility buildings. It is a complete township in itself. The Hundru Falls is created on the course of the Subernarekha river, where it falls from a height of 98 metres (322 ft) creating one of the highest water falls in the state. The different formations of rock due to the erosion by the constantly falling of water have added to the beauty of the place. The Hundru Falls at one of the edges of the Ranchi plateau is one of the several scrap falls in the region. During rainy season, it takes a formidable form but in the dry season it turns into an exciting picnic spot. At the base of the Hundru Falls, there is a pool, which serves as a bathing place. There are a total of 745 steps one necessarily has to get down from the top to get a complete view of the Fall. The best time to visit would be after monsoon, say September- November when there’s enough water. There are two ways to reach Hundru falls. One is via Angara block from Ranchi where the distance will be 45 kilometres (28 mi) from Ranchi, off the Ranchi-Purulia Road. One has to travel some about 21 kilometres (13 mi) from the main road. The other route (and the recommended one) is taking NH33 and then diverting on the road leading to Hundru falls. One can have Rajrappa darshan followed by visit to Hundru falls. There is also a Suvarna Rekha Hydal Project located down the falls which is also a good place for Tourists. 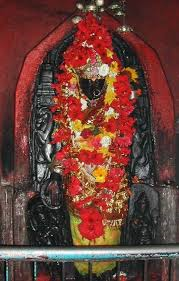 Deori temple, an ancient shrine dedicated to Goddess Kali, is situated in Tamaar village in Bundu block of Ranchi. 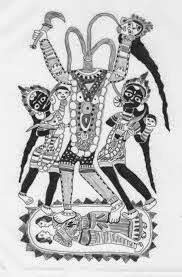 The idol of Goddess Kali has 16 arms and is locally known as 'Solahbhuji Devi'. Believed to be built by a tribal chief, the temple wall and pillars are made of sandstone. 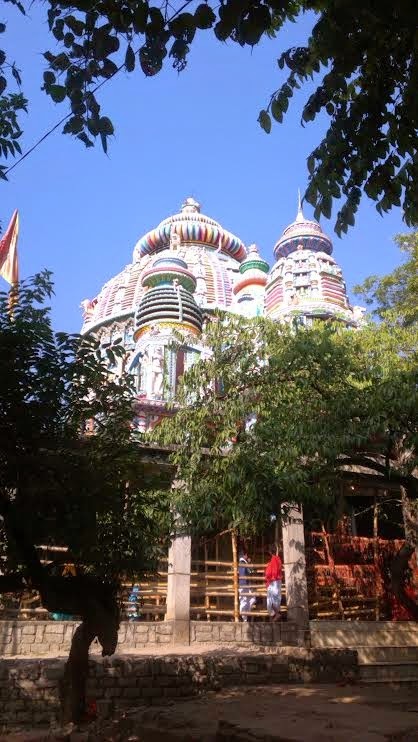 A new structure has been constructed over the old temple which includes a few domes that are sculpted with colorful images of Gods and Goddesses. The deity of this temple is believed to be very powerful. Devotees are seen tying red and yellow sacred threads onto bamboo poles that are kept in the premises. This temple has recently attained popularity, thanks to the regular visits of the famous cricketer MS Dhoni and his family. The temple is open on all days from 5.00 am to 8.30 pm. The best time to visit is during the Holi festival which is celebrated with great dedication. 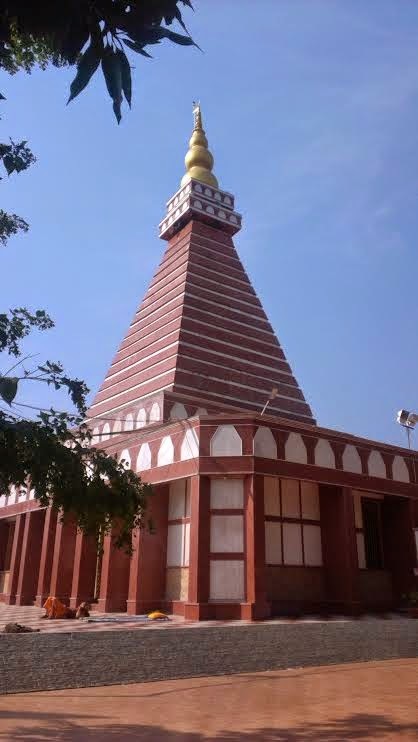 Deori temple is about 70 km from Ranchi and lies on the National Highway 33. It’s just by the side of the national highway. 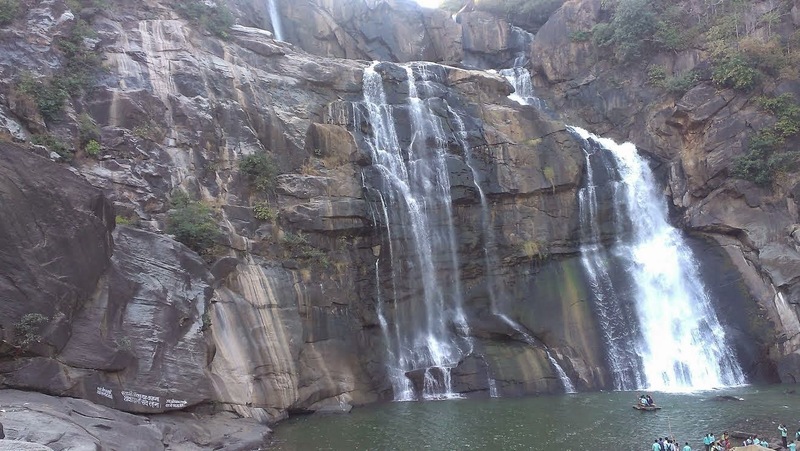 One can also visit Dassam falls which is 20 km away from Deori temple on the journey back to Ranchi. The Dassam Falls ( दशम जलप्रपात) (also known as Dassam Ghagh) is a waterfall located near Taimara village in Bundu police station of Ranchi district. Dassam is a changed form of word Da:song which in mundari (local) language means the act of pouring water. Da: means water and song means pouring or measuring. The water fall resembles like somebody is pouring water so the name was Da:song earlier but afterwards the name was changed to Dassam. The Dassam Falls is a natural cascade across the Kanchi River, a tributary of the Subarnarekha River. The water falls from a height of 44 meters (144 ft). The sound of water echoes all around the place. Dassam Falls at one of the edges of the Ranchi plateau is one of the many scarp falls in the region. The water of the Dassam Falls is very clean and clear. It is natural for a tourist to be enticed to enter the water for a bath or swim but tourists are warned not to do so because of the current that is generated. There have been many cases of drowning in Dassam Falls. Nine people died of drowning between 2001 and 2006. 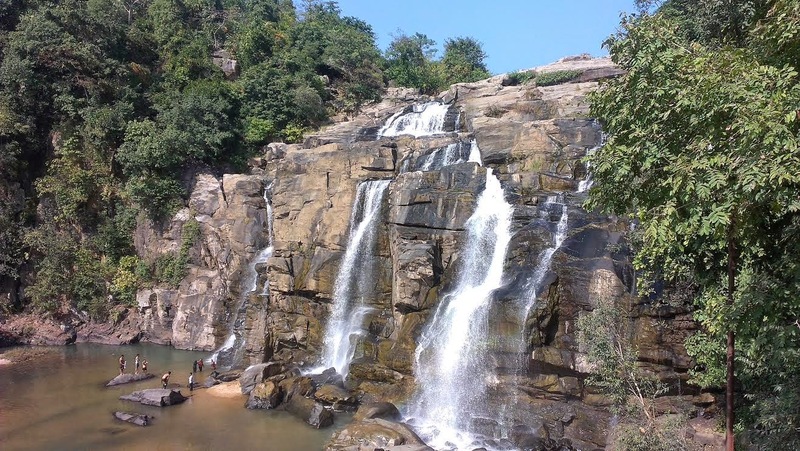 The Dassam Falls is 40 kilometres (25 mi) from Ranchi on NH 33 or Ranchi-Jamshedpur highway and can be seen on the journey back from Deori temple towards Ranchi. Situated at an edge of the Ranchi Plateau, the Jonha Falls is an example of a hanging valley falls. The Gunga River hangs over its master stream, Raru River and forms the falls. Water in the falls drops from a height of 43 metres (141 ft). All these three Falls are an example of a nick point caused by rejuvenation. Knick point, also called a nick point or simply nick, represents breaks in slopes in the longitudinal profile of a river caused by rejuvenation. The break in channel gradient allows water to fall vertically giving rise to a waterfall. The Jonha Falls is 40 kilometers (25 mi) from Ranchi. It is approachable by both road and train. Jonha Station is just 1.5 km from the fall. For travel by road, one has to take the Ranchi-Purulia Road and after travelling for about 20 miles (32 km) one has to travel about 3 miles (4.8 km) off the main road. A lot many people would apprehend that Ranchi/Jharkhand might not be safe because of maoist activities but it is also a fact that not a single incident has happened in any of these religious / tourist sites. I would recommend these places strongly primarily because they are beautiful and also because they are still not commercialized and continue to be pristine. I enjoyed and I hope you will enjoy as much. chaalaa baagundi sir - kallaku kattinatlu .. aratipandu volichinatlu. 1996 lo oka yogi atma katha chadivina tarwata, yeppatikaina yogada member ayyi akkada gadapalani .. unka materialise kaledum u hav rightly utilised ur time at yogada sir. gone thru all your post. very well written,yet not reaching to masses will like to post few short version on my facebook wall if get your permission. Really a amazing blog. Photos were amazing and nicely clicked. Thanks for sharing your experience and photos with us.keep posting like this. Ranchi is the capital of state Jharkhand, India. This scenic metropolis is also recognized as Chota Nagpur. Ranchi is known to the world for Bamboo forest and its altitude is 2,140 feet from sea level. Reddish soil and countless waterfalls is specialty of the Ranchi city. Greenery hills, infertile rocks and scenic charming valleys of Ranchi attract the visitors in large amount. Bharat taxi is one of the leading taxi and cab service provider in all over India.